Discover the most important sightseeing in Brazil during this trip: Visit Rio de Janeiro and some of the most famous tourist attractions in the world: The Christos statue at Corcovado and the sugar loaf. Enjoy relaxing on some of the most famous beaches in the world; experience the vitality of the cariocas and dance to some Latin American rhythms. Gaze the force of nature at the Iguaҫù waterfalls and discover the African spirit of Brazil in Salvador, which is one of the most important colonial cities. Arrival in Rio de Janeiro. A transfer to your accommodation is going to be organized – hotels stay and check-in. Attending to your arrival time you have free time to relax or we offer some optional excursions. After having a breakfast your day starts with an excursion to “Corcovado” which you arrive after passing the “Laguna Rodrigo de Freitas”. Return to the hotels, free time at the afternoon for relaxing or optional bookings. Overnight stay. After having breakfast in your hotel, a transfer brings you to the local airport to fly to Iguassu. Someone welcomes you at your arrival. A transfer to your accommodations and the check-in is organized as well. 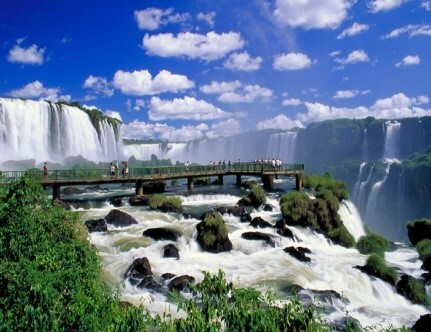 At the afternoon you have a trip to the Brazilian site of the national park to visit the Iguassu waterfalls. After having breakfast, a transfer brings you to the Argentinean countryside of the waterfalls. Here you travel by jungle train and finally arrive at a breathtaking canyon called “Garganta del Diabolo” (Canyon of the devil). By using some hiking routes it is possible to access the lookout point “Alvar-Nunes”, the waterfalls called “Bozetti”, “San Martin” and “the two sisters”. (Duration: 5 hours)Return to the hotels and overnight stay. After having breakfast at your hotel, a transfer brings you to the airport to fly to Salvador de Bahia. Someone welcomes you there and you travel to your hotels by using the transfers. There you have an overnight stay. After breakfast you have free time to relax. In the afternoon a city tour starts to discover the history, the tradition and the development of this fascinating city. The famous urban district “Pelourinho”, with its kept colonial architecture, is part of UNESCO world cultural heritage. A walk through the tight streets, passing the town hall square, the church and the abbey called “São Francisco” down to the hotspot of Salvador (the place named “Largo do Pelourinho”) is an absolutely must. You travel to the airport by using the organized transfers to take the flights to your next destination.